Ever wonder how different settings affect the look of a Diamond ring? 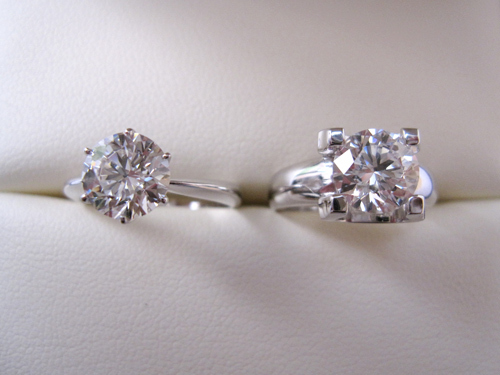 Here are two Diamonds of 1.50ct, with the same dimensions in two different ring settings. Our two examples here are a Classic 6-claw setting with a thin slightly tapered band on the left, and a 4-claw setting with a rounded broad band on the right. As you can see, there are many factors that play part in the look of each setting. A thin band, accentuates the Diamond and makes it look bigger. But on the other hand, the thick claws on the 4-claw setting, make the overall effect bigger. Together with the broader band, it is a more solid looking ring, where the 6-claw is a feminine classic!